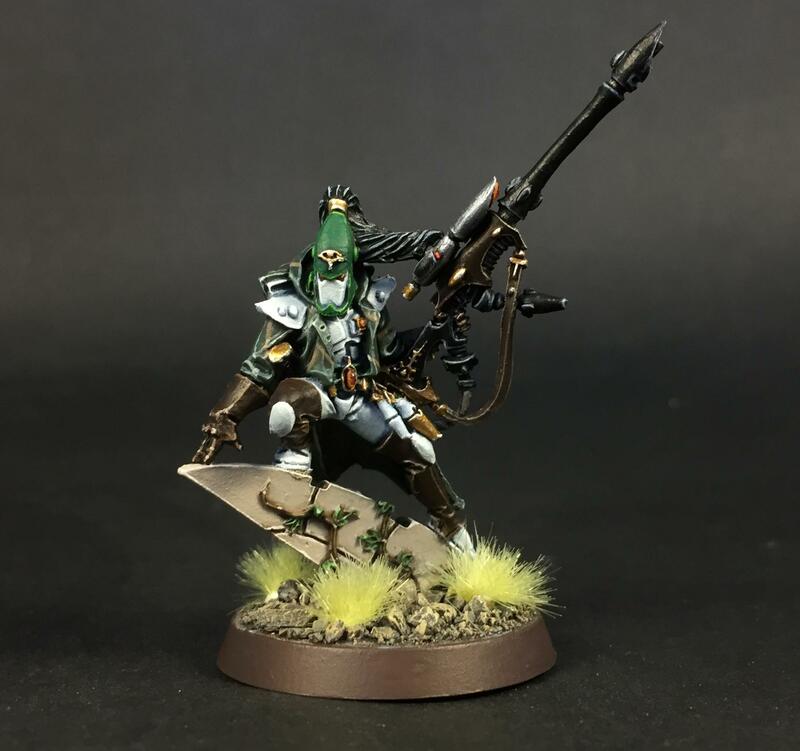 Subject: LDP's Blog: 4th Oct - Biel-Tan Eldar Kill Team - Dire Avenger Exarch Done! It's been a couple days. That's not to say I haven't been productive! I finished the third and final dire avenger for my Biel-Tan kill team. I now have to wait for a second package from GW before I can continue with them, which at this point is taking suspiciously long to arrive In the wake of that, I've decided to work on a couple deathwatch vets, because the short stint I had into a deathwatch blog in 2016 didn't come to much - but I can easily expand what I did into another cool little kill team! The more kill teams, the merrier I say! Also, because I'm nostalgic for my Ultras, I took a bunch of group shots again I'm also awaiting Calsius in the mail, whereafter I shall be doing up some smurfs for a kill team of their own. ALSO ALSO - I touched up Guilliman a little, as my gold scheme when I started back up this year was initially a little flat. That sword . 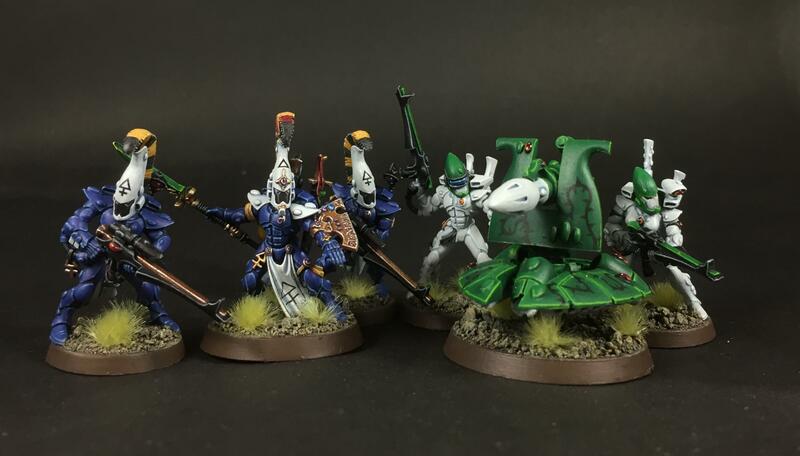 Those Eldar are looking great too. 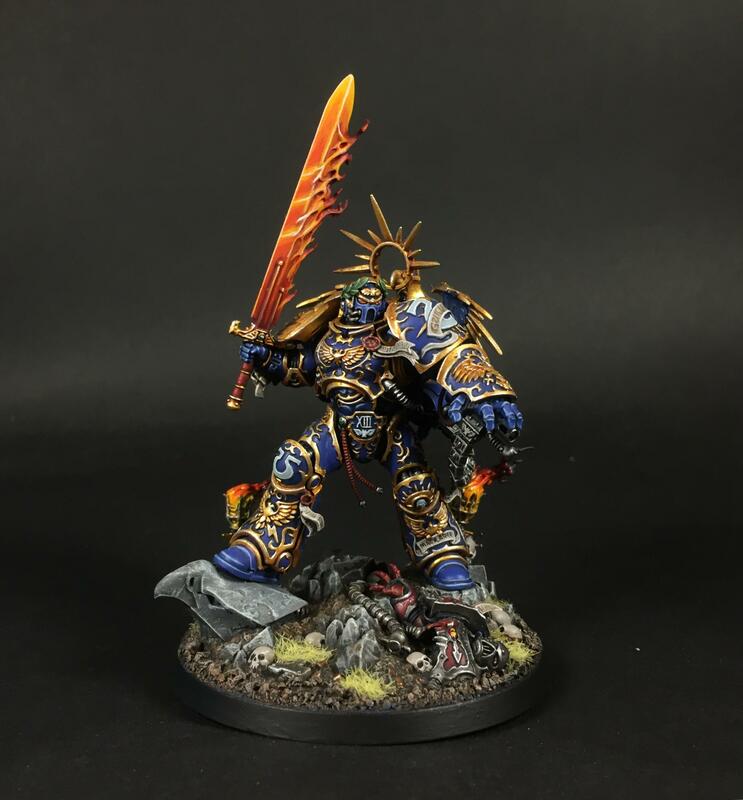 Excellent looking Dire Avenger yet again and Guilliman looks like a beast, the whole army looks stunning! Awesome pics man, as usual. The first army shot is really something. 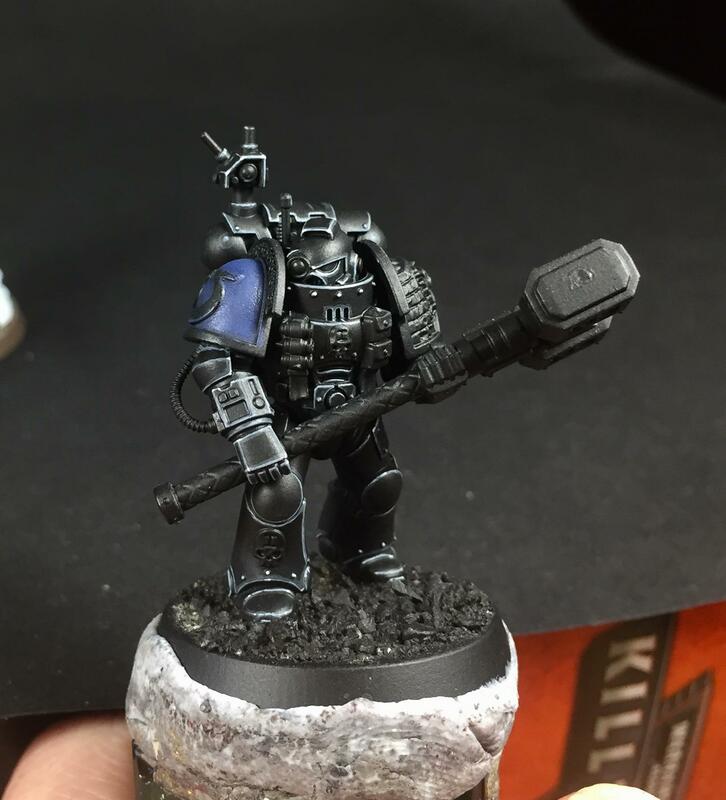 Nothing says “serious business” like a heavy thunderhammer. Nice menace from that guy. 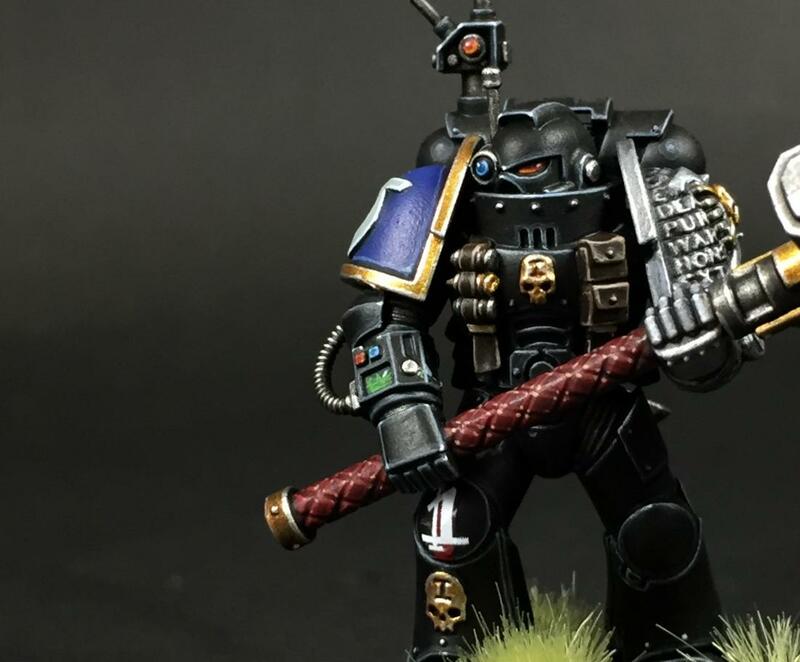 Subject: LDP's Blog: 16th Oct - Kill Team - Deathwatch Combat Specialist Ennius Spinther Done! Just beautiful. The helmet is amazing, and the haft is outrageous. 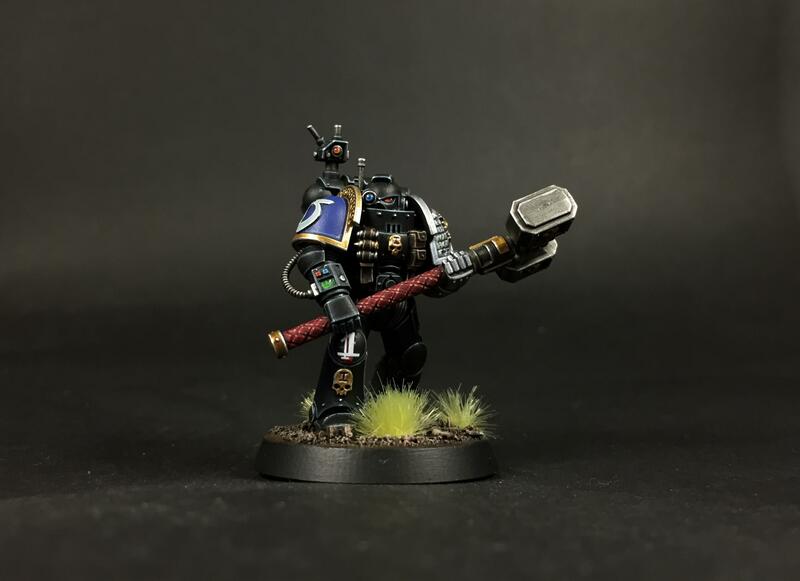 Subject: Re:LDP's Blog: 16th Oct - Kill Team - Deathwatch Combat Specialist Ennius Spinther Done! Nothing says "you're proper fethed" like a massive hammer and a mean look (which I must assume that marine is giving!). That Eldar kill team is really coming together well. Should look good with the addition of a pathfinder or two. And your army shots are just spectacular. Looks like an army marching off to war. 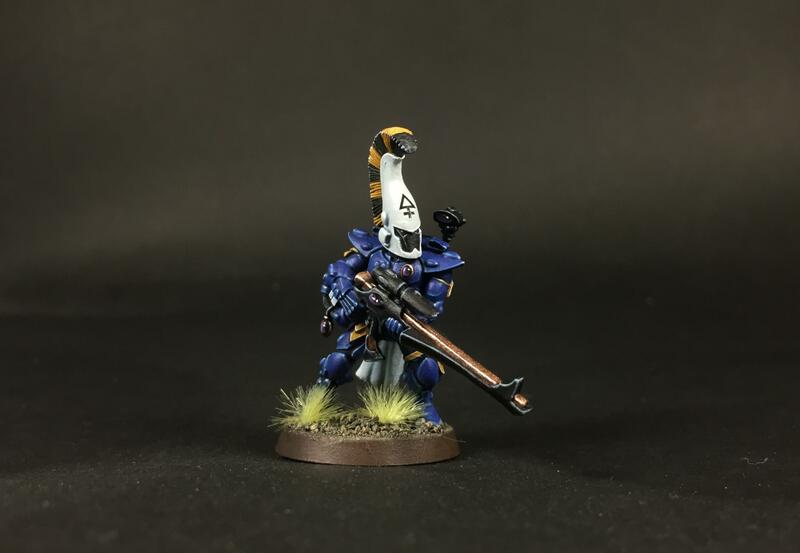 Here, at last, is the leader for my Eldar kill team! I have to say, Finecasat is very annoying. Not a fan of how severely it affects casting quality. Add on to that that so much of the stuff my makes my paint work decent depends on clean edges to highlight! BAH! I'm satisfied with the mini overall, but I wish it were plastic. Looking good man! I've luckily managed to avoid finecast, sounds like its been nothing but disappointing. Still looks ace though! These are looking fantastic. Really good photography, too. We have just abandoned our Eldar force, which were Biel-Tan... perhaps it's good to cut our losses as they would never look as beautiful as yours! Great work. Nice work on the sniper. I’ve had some decent experiences with finecast. My Sgt. Talion was fine. He’s a solid chunk, without a lot of spindly bit and details. My TFC was a mixed bag. Again, being mostly solid helped, as did me thinking of how bad it would be in metal. The servo harness on the tech was a little dicy. But all my Eldar in finecsat have been twitchy at best. They have so much tiny detail, bubbles screwed up a lot of them, and injection ports meant you have to carve your own detail back in places. And my rangers have wobbly gun syndrome in a bad way. Love that model. I had actually ordered him when I got back into Eldar, but the store screwedup and didn’t get him. After looking at the rest of the finecast I picked up, I told them never mind. I was thinking about eldar specialists the other day and how to distinguish them. He’s a stand out for rangers. @Hivefleet Oblivion: Don’t let the fact that LDP pains so well hold you back, steal his ideas and use him for inspiration. Wales: Where the Men are Men and the sheep are Scared. Looks real good. I have 4 Lhamaeans due to the vagueries of Finecast. Just gave up after a while. Lovely work on the ranger, even if it is Failcast/Finecrap. Really nice job on your ranger, I've gone through 3 replacements of Zoanthropes just trying to get one that hasn't been destroyed with bubbles. I have a set of finecast rangers that require hot water to fix the rifles. I tend to avoid it where I can now. Out of this world painting skills. Must be something in the water down there. Hey everyone, thanks again for all your lovely feedback. Means the world to me and everything is taken in and considered! It's a huge motivation to keep the painting going. Sorry I've been AWOL for a good few days. I'm smack bang in the midst of the toughest exam period I've ever had (postgrad is tough, unsurprisingly). Regardless, many of you perhaps know how much I love the classic T'au Sept scheme. The early naughties era, rich blue sky plastered over the top of a blazing desert with fire warriors, battlesuits and pulse fire was a huge 40k inspiration for me early on. So, as I have been many times before, I'm back on the Tau buzz! I'm hopping all over the show at the moment, goodness knows what's wrong with me. 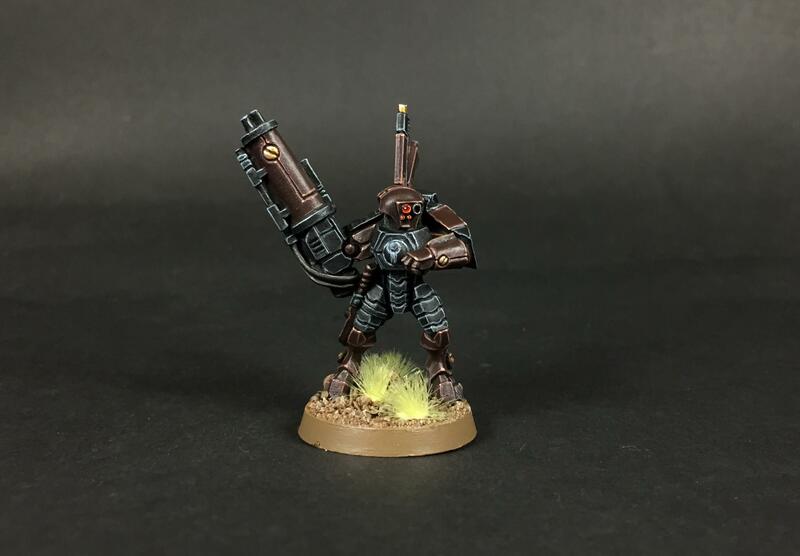 In any case, here's the breacher Shas'ui I painted up as a test model. I'm very pleased with how it's come out and I'm looking forward to adding more bodies to the finished pile! That's really nicely done, proper sense of resilience and toughness that you've got out of that pose. I'm always impressed by how clean and crisp your paint jobs are. Consistently good quality! @Paradigm cheers! Yeah, I took a head from the pathfinders box. His grizzly stare really suited the stoic stance I thought. @DV8 Thank you, hopefully this next update holds up! They could use a touch of weathering. 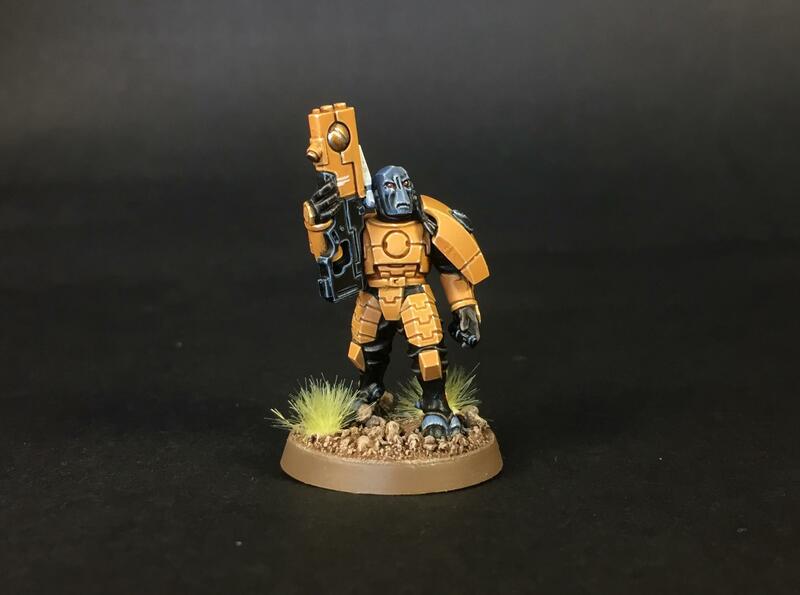 Some sucking chest wounds always look good on Tau. Nice work as always, even on filthy xenos. 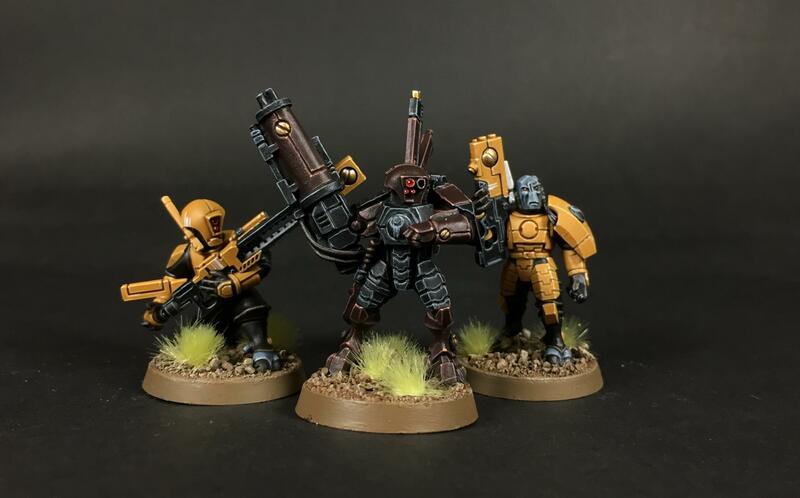 Those Tau looks great! I think they really suite the clean and crips paint style you've got. T'au Sept has such a great colour scheme as well. They work really well with your basing scheme too. 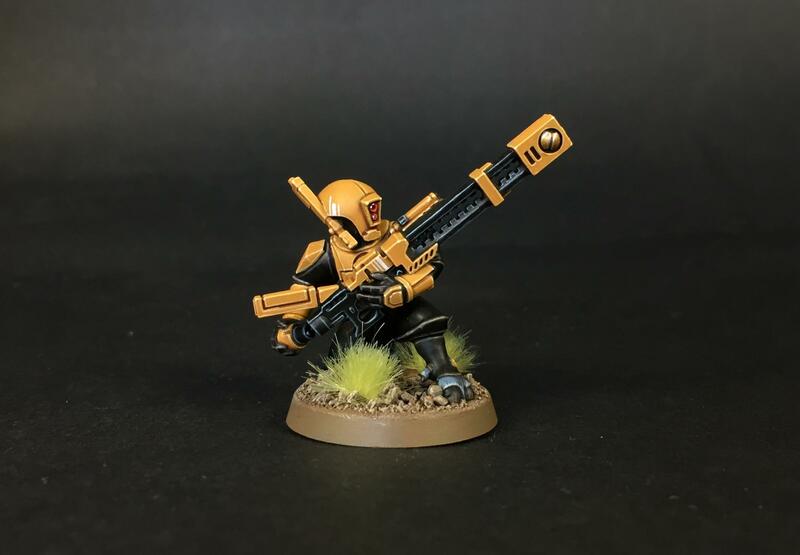 Excellent looking Tau, the pathfinder is definitely my favourite of your Tau so far. I think I've inadvertently come across your Instagram at some point so I was wondering where I'd recognised them from! Great stuff, beautiful brushwork as usual! Looking great! Nice to see the older stealth suit. Sweet edge work.